During our 20th anniversary year, we have showcased two tasting menus which have been incredibly popular with new and old customers alike. So, when we were asked to showcase another tasting menu having just been awarded two AA rosettes for culinary excellence we thought this was perfect timing! 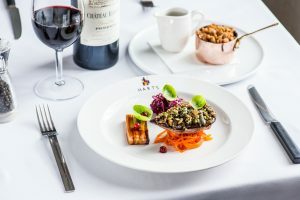 We are showcasing the classic modern British dishes that we are renowned for using quality produce in a unique 6-course tasting menu perfectly paired with carefully selected wines by Tim Hart. 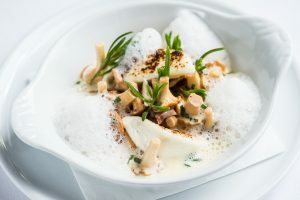 This tasting menu is a fun way to experience the best from head chef Dan Burridge with a twist from Michelin Star Chef Aaron Patterson from our sister restaurant at Hambleton Hall. With them running the show, you can expect the food to be divine. The full menu will be available throughout September during the evening only and excluding Saturday and includes six taster sized courses followed by coffee and petit fours. You will also receive a complimentary mini sourdough from Hambleton Hall to take home with you. A little reminder of your evening with us! This smooth, rich parfait is one of our classic dishes. This is a fantastic way to showcase Mediterranean vegetables that are at their best in September. 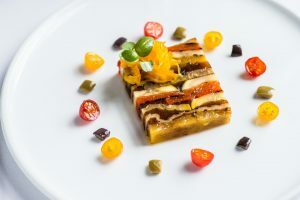 The vegetables are cooked separately and layered in a terrine. A dish packed full of colour and flavour with aubergine, peppers and courgette and a hint of horseradish. This light is refreshing yet full of vibrant flavour will transport you back to Thailand with lemongrass and coconut dancing on your taste buds! A deliciously earthy dish full of flavour which will remind you of Autumn. Discover the exquisite taste and fruity aroma of fresh girolles, bright yellow in colour with a hint of apricot. Perfectly paired with the smokiness of the bacon and soft cream cheese which is smoked in-house. Roast grouse is such a treat and we love to have it on the menu when it is in season. 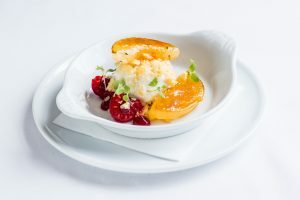 Its flavour is delicious and unique, and we have given it a modern twist with adding sharp pickled elderberries with seasonal butternut squash. Another classic dish which is fantastic with our own twist and sweet enough to finish off a perfect evening. Should you have any food allergies or specific preferences, please let us know in advance. A vegetarian menu is available upon request. The tasting menu is only available to the whole table and please allow 2.5 hours to fully enjoy this wonderful experience. 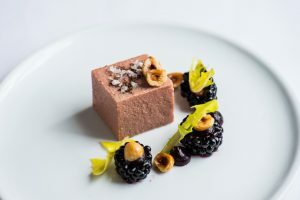 Our tasting menu is available for dinner on Sunday to Friday throughout September and is priced at £65 per person. Wine pairing will be available for an additional £55 per person. Food like this served in such wonderful surroundings deserves an overnight in our award-winning boutique hotel. 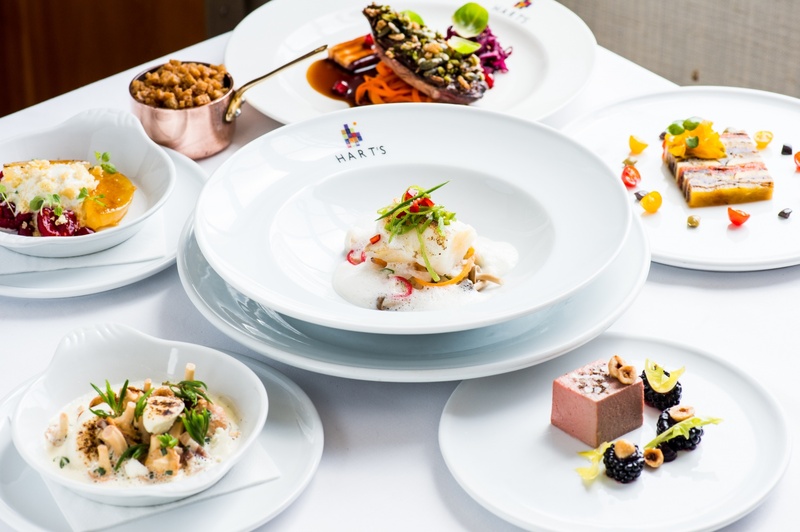 Enjoy an overnight food experience package from only £279. 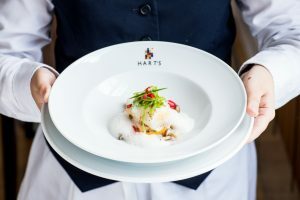 This includes an overnight stay in a classic double room with a complimentary upgrade if available, a glass of Champagne on arrival, 6-course tasting menu in Hart’s Restaurant and breakfast for two. To reserve your table or book the overnight package call 0115 988 1900. Full pre-payment is required to secure your reservation. Cancellation policy is 48-hours.